You need more then an overlay - you also need to change the Crystal inside of your speedo... here are some overlays a made a while back but never ended up using. I could just get rid of the MPH in the middle and make the outside MPH, that will get you to 180 and not be too much work, sound good? well im telling you all im getting a f355 and i need all parts i need and this i want. when can you have them ready? can i get one with 200mph on the dash???? 355 Rydar : These gauges aren't actuall functional, that is if you print them out and install them your speedometer will read WAY off. In order to get the the proper 355 looking lights you should buy a set of VDO gauges, which will set you back $200-400 I believe (others on the forum will know more about this). 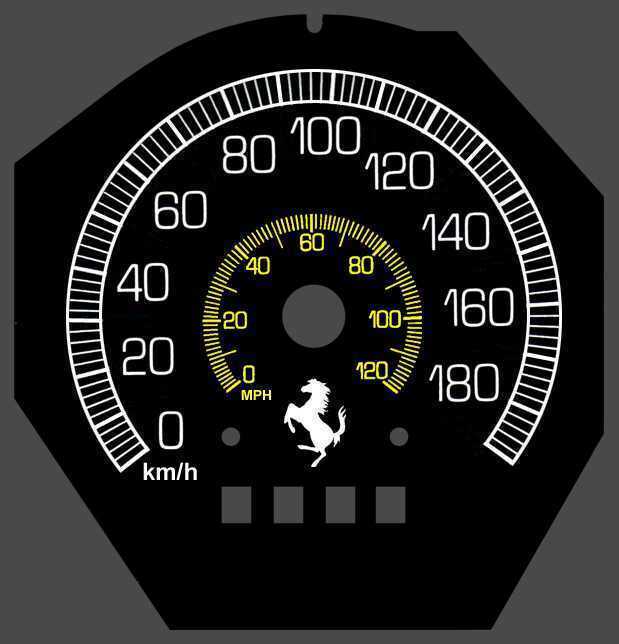 I can get VDO's WITH the Ferrari logos silkscreened INSIDE the gauge on the face where it belongs. A full set, seven gauges, in Black (original) or white faced for around $1000 if anyone is interested. 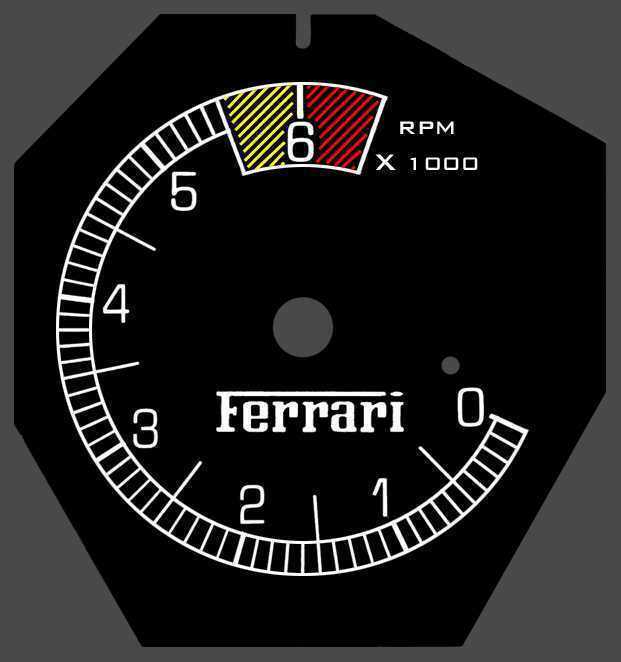 These gauges are modified (with the Cavallino) by VDO so they carry the full factory warranty, and with the harness, plug right in with not need for crystal mods. Speedos and Tachs are available at both 120mph/6000rpm and 220mph/10,000rpm. You know which set I got, huh? Anyway, let me know if you want a set! ISSPRO has a 160 mph speedo and 8k tach. Check out www.ISSPRO.com - look at the enhanced visibility line. I have a full set of the enhanced visibilty gauges and love them. You'll need to use their sending units for COOLANT TEMP; OIL PRESSURE and FUEL.